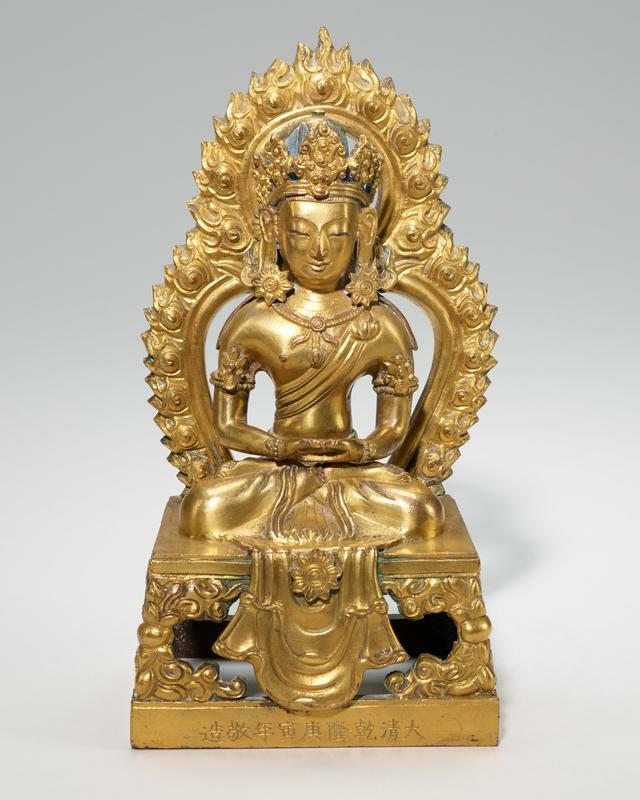 Such popular Buddhist images as Avalokitesvara, the compassionate one, were occasionally produced in sets. Since the act of making or commissioning a religious work was considered pious in itself, those who could afford it often commissioned multiple images. Here the jeweled and crowned deity is represented as a perfectly poised yogi seated in the lotus posture on a dais, the hands placed together in the lap forming the dhyana mudra, the gesture of meditation. The figures are set off by aureoles adorned with a flame motif representing purity. The identical inscriptions written in Chinese characters across the bases read: "Reverently made in the Kang-yin year of Qianlong (1770) during the great Qing Dynasty."